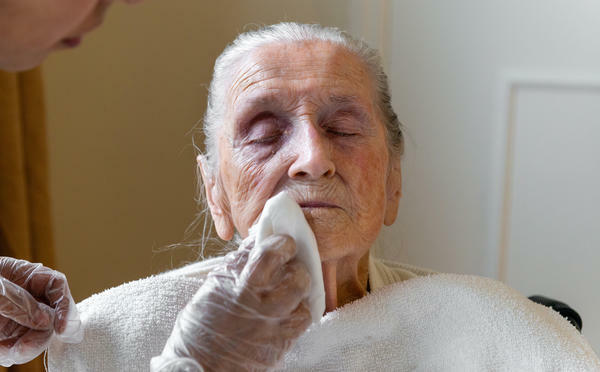 A certified nursing assistant wipes Neva Shinkle's face with chlorhexidine, an antimicrobial wash. Shinkle is a patient at Coventry Court Health Center, a nursing home in Anaheim, Calif., that is part of a multicenter research project aimed at stopping the spread of MRSA and CRE — two types of bacteria resistant to most antibiotics. Hospitals and nursing homes in California and Illinois are testing a surprisingly simple strategy to stop the dangerous, antibiotic-resistant superbugs that kill thousands of people each year: washing patients with a special soap. The efforts — funded with roughly $8 million from the federal government's Centers for Disease Control and Prevention — are taking place at 50 facilities in those two states. This novel collaboration recognizes that superbugs don't remain isolated in one hospital or nursing home but move quickly through a community, said Dr. John Jernigan, who directs the CDC's office on health care-acquired infection research. "No health care facility is an island," Jernigan says. "We all are in this complicated network." At least 2 million people in the U.S. become infected with some type of antibiotic-resistant bacteria each year, and about 23,000 die from those infections, according to the CDC. People in hospitals are vulnerable to these bugs, and people in nursing homes are particularly vulnerable. Up to 15 percent of hospital patients and 65 percent of nursing home residents harbor drug-resistant organisms, though not all of them will develop an infection, says Dr. Susan Huang, who specializes in infectious diseases at the University of California, Irvine. "Superbugs are scary and they are unabated," Huang says. "They don't go away." Some of the most common bacteria in health care facilities are methicillin-resistant Staphylococcus aureus, or MRSA, and carbapenem-resistant Enterobacteriaceae, or CRE, often called "nightmare bacteria." E.Coli and Klebsiella pneumoniae are two common germs that can fall into this category when they become resistant to last-resort antibiotics known as carbapenems. CRE bacteria cause an estimated 600 deaths each year, according to the CDC. CRE have "basically spread widely" among health care facilities in the Chicago region, says Dr. Michael Lin, an infectious-diseases specialist at Rush University Medical Center, who is heading the CDC-funded effort there. "If MRSA is a superbug, this is the extreme — the super superbug." Containing the dangerous bacteria has been a challenge for hospitals and nursing homes. As part of the CDC effort, doctors and health care workers in Chicago and Southern California are using the antimicrobial soap chlorhexidine, which has been shown to reduce infections when patients bathe with it. The Centers for Disease Control and Prevention funds the project in California, based in Orange County, in which 36 hospitals and nursing homes are using an antiseptic wash, along with an iodine-based nose swab, on patients to stop the spread of deadly superbugs. Though hospital intensive care units frequently rely on chlorhexidine in preventing infections, it is used less commonly for bathing in nursing homes. Chlorhexidine also is sold over the counter; the FDA noted in 2017 it has caused rare but severe allergic reactions. The Chicago project, which started in 2017 and ends in September, includes a campaign to promote hand-washing and increased communication among hospitals about which patients carry the drug-resistant organisms. The infection-control protocol was new to many nursing homes, which don't have the same resources as hospitals, Lin says. "We don't have an infinite amount of time," Zahn says. "Taking a chance to try to make a difference in CRE's trajectory now is really important." 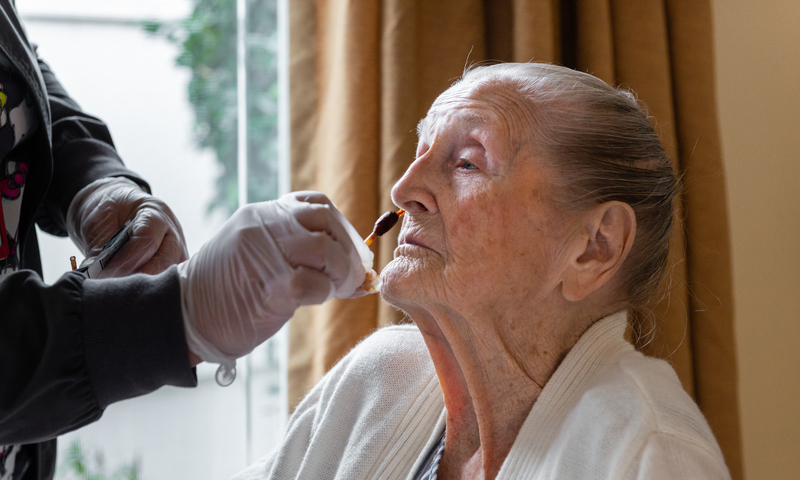 The CDC-funded project in California is based in Orange County, where 36 hospitals and nursing homes are using the antiseptic wash along with an iodine-based nose swab. The goal is to prevent new people from getting drug-resistant bacteria and keep the ones who already have the bacteria on their skin or elsewhere from developing infections, says Huang, who is leading the project. Licensed vocational nurse Joana Bartolome swabs Shinkle's nose with an antibacterial, iodine-based solution at Anaheim's Coventry Court Health Center. Studies find patients can harbor drug-resistant strains in the nose that haven't yet made them sick. Huang kicked off the project by studying how patients move among different hospitals and nursing homes in Orange County — she discovered they do so far more than previously thought. That prompted a key question, she says: "What can we do to not just protect our patients but to protect them when they start to move all over the place?" Her previous research showed that patients who were carriers of MRSA bacteria on their skin or in their nose, for example, who, for six months, used chlorhexidine for bathing and as a mouthwash, and swabbed their noses with a nasal antibiotic were able to reduce their risk of developing a MRSA infection by 30 percent. But all the patients in that study, published in February in the New England Journal of Medicine, already had been discharged from hospitals. Now the goal is to target patients still in hospitals or nursing homes and extend the work to CRE. The traditional hospitals participating in the new project are focusing on patients in intensive care units and those who already carry drug-resistant bacteria, while the nursing homes and the long-term acute care hospitals perform the cleaning — also called "decolonizing" — on every resident. "It kills germs," Shinkle responded. "That's right. It protects you from infection." In a nearby room, senior project coordinator Raveena Singh from UCI talked with Caridad Coca, 71, who had recently arrived at the facility. She explained that Coca would bathe with the chlorhexidine rather than regular soap. "If you have some kind of open wound or cut, it helps protect you from getting an infection," Singh said. "And we are not just protecting you, one person. We protect everybody in the nursing home." Coca said she had a cousin who had spent months in the hospital after getting MRSA. "Luckily, I've never had it," she said. Coventry Court administrator Shaun Dahl says he was eager to participate because people were arriving at the nursing home carrying MRSA or other bugs. "They were sick there and they are sick here," Dahl says. Results from the Chicago project are pending. Preliminary results of the Orange County project, which ends in May, show that it seems to be working, Huang says. 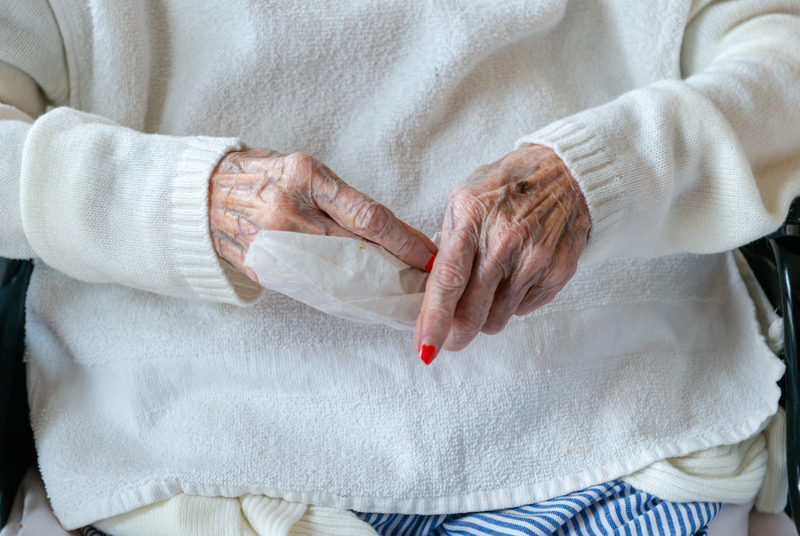 After 18 months, researchers saw a 25 percent decline in drug-resistant organisms in nursing home residents, 34 percent in patients of long-term acute care hospitals and 9 percent in traditional hospital patients. The most dramatic drops were in CRE, though the number of patients with that type of bacteria was smaller. The preliminary data also show a promising ripple effect in facilities that aren't part of the effort, a sign that the project may be starting to make a difference in the county, says Zahn of the Orange County Health Care Agency. "In our community, we have seen an increase in antimicrobial-resistant infections," he says. "This offers an opportunity to intervene and bend the curve in the right direction." Kaiser Health News is a nonprofit news service and editorially independent program of the Kaiser Family Foundation. KHN is not affiliated with Kaiser Permanente.